Living just outside of the City of Falls Church, I often found myself in the city for the quaint family restaurants, the nightlife scene and the great community events. One of my favorite things to do while living in the area was walk down to the Falls Church Farmers Market on Saturday mornings. It was such a relaxing way to get the weekend started, and each week I would see some of the friendly faces of Falls Church. 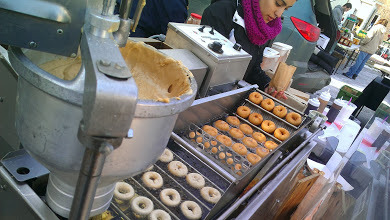 My favorite part of the market has to be the doughnuts! Sure, the fresh healthy fruits and vegetables offered by local farms and growers are delicious…but the doughnuts! Can I have one now please! Mama’s Donut bites is the name of the company and they make the donuts right in front of your eyes. It really is worth a trip just to check them out. (and while you are there maybe buy something green…you know for health). As the Marketing Director for the Nellis Group, it is always exciting to be able to let people know about a home on the market that is close to the City of Falls Church so they can enjoy some of the fun activities I did. Our featured listing (see balcony view below) is located just a few miles down Route 7, and is a 2 bedroom condo (take the 3D Tour) in a fabulous building. If I lived there I’d be at Taco Bamba all the time, but I’d also make sure to head into “The Little City” as well for the farmers market. For more information on this great condo in Idylwood Towers and others like it in the area, contact a Nellis Group Fairfax County community expert today at 703-348-6442!